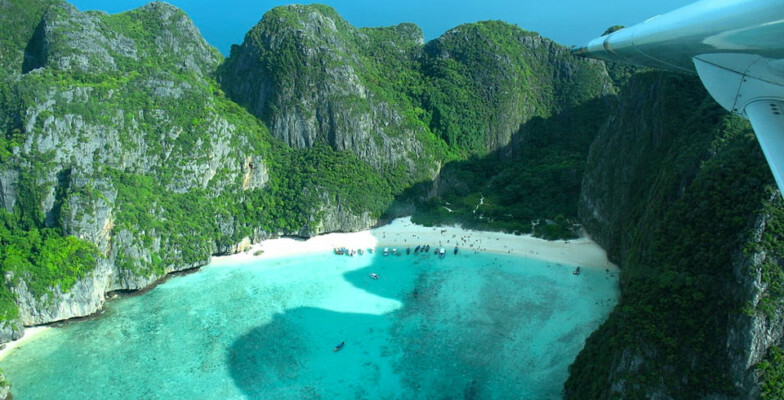 Maya Bay on Phi Phi Leh Island will be closed from June until September next year by not allowing boats to access and anchor in the bay waters. The decision was made at the meeting with national park officials that Maya Bay will go into a restoration period to allow the marine environment to recover from heavy tourism. It was as far back as December 2015 when concerns were raised that Maya Bay was facing coral extinction and a plague of other environmental concerns brought on by the ‘overtourism’. The island, known as a top tourism destination for more than 20 years, was then seeking help from the government and tourism operators to look after its natural resources. May Bay and its beach saw a huge rise in popularity after the Leonard DiCaprio film “The Beach” came out. Parts of the film were shot on the beach. However, tourists will still be able to visit the famous beach as their boats will land in Samah Bay, and the tourists can then walk across the island to Maya Bay. To choose from the many cruising destinations for your private yacht charter in Thailand visit our Destinations section.